I have recently returned from a wonderful masterclass with Sarah Key which was located at Prince Charles’s residence in Highgrove. Sarah Key is a well-known Australian physiotherapist. You may have heard of her but not quite remember why? Let us remind you… Sarah looks after the Queen and the Royal Family and has been awarded an MVO (member of the Victorian Order) in 2003; she has written several excellent books on back pain, most notably ‘The back sufferers bible’; and she has developed a marvelous system of diagnosing and treating spinal pain. So, I was very excited to hear that she was running a masterclass in the UK to learn about her take on simple back pain and how to treat it. Fortunately for all of us, Sarah (enthusiastically backed by Prince Charles) is intent on teaching her approach to the rest of the world. And I am now a convert to her simple understanding an approach to the 5 stages of break down and most importantly her effective treatment regime and self help exercises patients. You will now find me on my back every evening in front of the TV practicing what I preach. 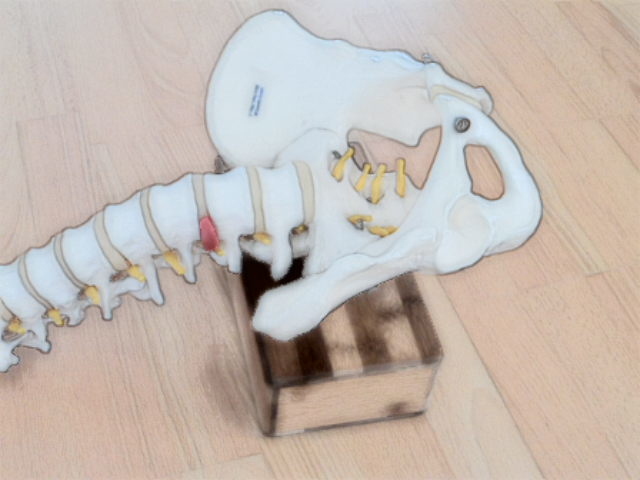 The spine consists of separate blocks of bone called vertebrae. In between each vertebra sits a hydrated fibrous disc that acts as a connector and shock absorber. The discs stay healthy by sucking in and squeezing out the nutritious fluid that surrounds them in a sponge-like manner. Back problems begin when a disc becomes unduly dehydrated through excessive compressive loading (mainly through prolonged sitting) and a lack of expansive spinal movement. Over time, this causes the lowermost discs to lose the ability to absorb shock and resist stretch. The outer wall of the disc is called the annulus fibrosis: this is the only part of the disc with a nerve supply and therefore capable of sending the brain signals of pain. Spinal pain then worsens as surrounding joints and ligaments adaptively shorten and further restrict spinal movement. In addition, spinal muscles develop a protective muscle clench [called spasm], which simultaneously inhibits your abdominal muscles, and the deep spinal muscles which control segmental movement. This cascade of breakdown is of course, entirely counterproductive as the evidence based science suggests: discs need to receive nutrition from the fluid sucked in and pushed when squashed and pulled apart with everyday movement. Sarah advocates stretching and compressing the disc by performing full range, large-scale spinal movements to cause significant disc pressure changes and shunt nutritious fluid in and out of the disc. This is achieved by using a small block (called a BackBlock – see website www.sarahkey.com) under your back followed by spinal bending movements such as squats and knee hugs. Sarah combines this with her own ‘feet on’ treatment methods to mobilise and loosen individual vertebrae that need un-jamming. This is one of the treatments we offer at Datchet Osteopathic Clinic. We don’t quite walk on your back, but we do get you to lie face down on the floor and use our heels to mobilise your back. It’s incredibly effective and not as painful as it sounds! (in fact most patients describe it as a “sweet pain”). This approach to treatment is always accompanied by the backblock exercises which are quick and easy to perform. This entry was posted in Back Pain, Uncategorized and tagged back pain, disc health, sarah key by admin. Bookmark the permalink.